There is an interesting relationship between model and real railways. The Class 415 Adams Radial Tank is an interesting example of this relationship. We won’t go into too much detail about the prototype here (that’s for a future blog post,) but the class has for long dominated wishlists for new models, despite the only surviving example found on the Bluebell Railway having been out of action for some time and the class having a limited life (except three examples of the class.) So although historically speaking it is perhaps not the most important type, the consistent pressure from wishlists meant that there was a growing expectation from consumers of a model being produced. It is fair to say that manufacturers couldn’t help but consider producing a model of it. However, it is a complicated prototype to recreate in miniature and will be difficult to get right, plus despite the load cries to produce one, it is not a type that was used much in the context of the nations railways. In the past few years Bachmann in particular have looked to the Bluebell Railway as a source for ideas and details for new model development. They produced a model of the South Eastern and Chatham Railway C class, the GWR Dukedog and also have the LBSCR E4 and Atlantic classes in the drawing room. The firm looked at the Adams Radial Tank too, but decided that the complexity and cost to build the complicated lines of the distinctive prototype too high. This effectively provided an invitation for others to have a look and come to their own conclusions. Producing a model in ready to run form is not a simple or cheap process. Having spoken to Dave Jones of DJ Models, the cost for tooling a new model is in the region of £100,000. The question therefore was who was prepared to give producing a model of the radial tank a go? The answer to this was multiple – three other manufacturers that we know of. The news that diecast model manufacturer Oxford Models decided to branch out and embark on their first 00 scale model project hit the press prior to Warley 2014. They chose the Adams radial tank as their first subject to model. The Adams radial tank was a prototype with a pretty good business case in some respects; there is a known demand and the firm that was most likely to produce it (at the time this was Bachmann due to Hornby’s production troubles) had already confirmed that they were out. However a model that does well in wishlists does have risk attached to it as other manufacturers are likely to be thinking the same. It turns out that this risk was particularly high in this case. 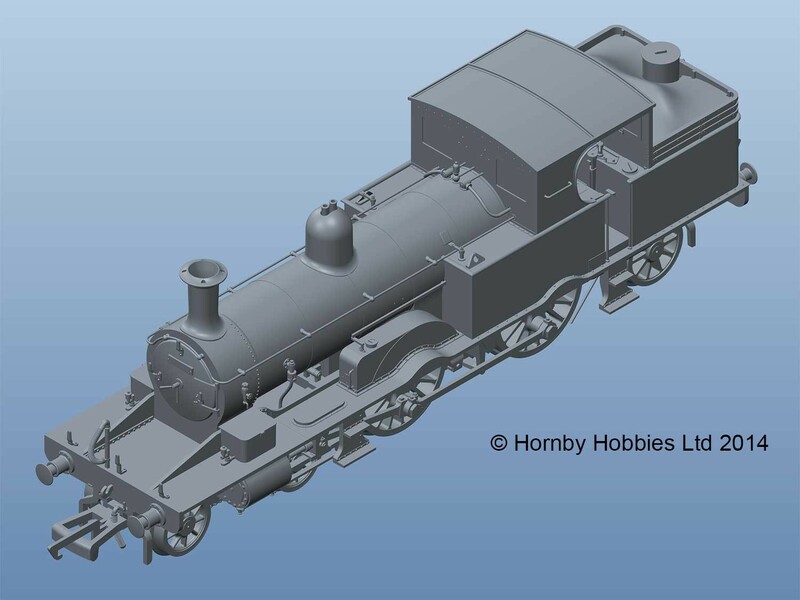 Hornby who were and are coming back as a force to be reckoned with; announced at Warley that they were developing a Adams radial tank model of their own. It turns out that they were not the only other company with their sights on the Adams Radial Tank. Kernow Model Railway Centre who have already developed the LSWR Beattie well tank (below) and are getting closer to completing the 02 class were looking at the radial too, in collaboration with DJ Models. In many ways this would a natural progression for Kernow after their models of the well tank and 02 class. Dave Jones commented that there were four manufacturers looking at a model and it is likely he was talking of the radial. Whether this was the case we can not be sure, but given Bachmann’s consideration it can be assumed it is. Bachmann’s withdrawn intentions have long been known and Kernow have pulled out from the race to build a model Adams radial tank too. As far we know it is a two horse race now, but given Dave’s comment you can’t help but wonder if he was referring to a different fourth! Anti-competition laws prevent manufacturers drawing up lists of models for them to work exclusively on. I have read many comments that this is a shame, but competition is vital in any market. Why would any manufacturer need to make any effort in developing their models if they knew the consumer had no choice? I’m pretty sure we’d have a much less vibrant model railway industry if this was the case. I’m also pretty sure that Hornby and Oxford Rail will make an extra effort to produce as good a model as they can. However needless to say with such a crowded market place it is likely that those who shout loudest will getting a model and more than one manufacturer take the plunge. 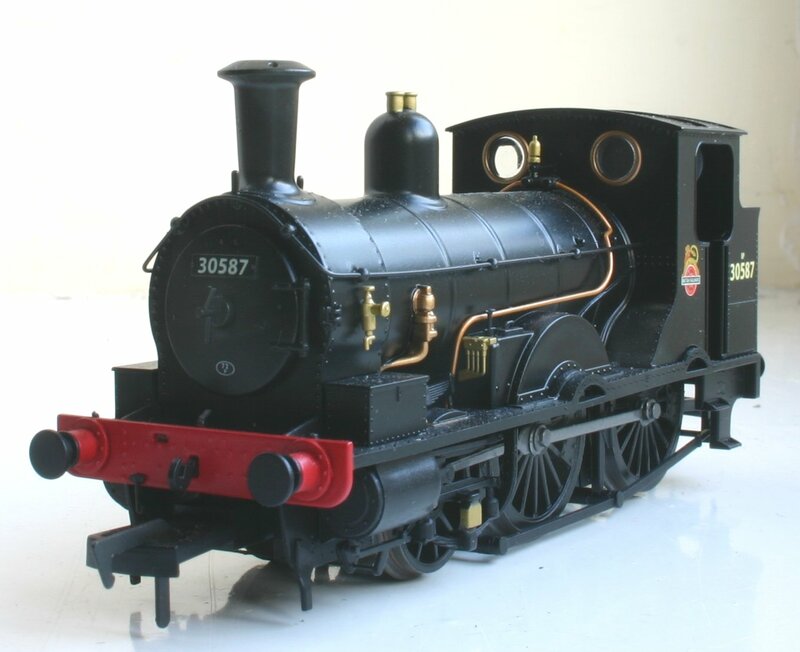 The 00 scale LSWR class 415 Adams Radial Tank story is not completely unique, although the number of different manufacturers involved in consideration of the model is possibly unprecedented. Other models have had multiple and concurrent examples of the same class produced in model form by different firms. Consider other 00 scale duplications – the class 08 diesel shunter, LNER B1, BR standard 9F (below) and 4MT 4-6-0 for instance. These are prototypes that took many forms; indeed it is likely that consumers would consider more than one example of any of these. The options also usually present the consumer a choice of price versus detail. Even then, the 4MT 4-6-0 was not particularly successful by many accounts. The Adams Radial tank, although popular has very limited options in terms of liveries and running numbers compared to those other examples and unless you are producung a model of the Lyme Regis branchline, I’d expect one model would suffice for most people. Plus, although I would never say that it is easy to get a model looking and running well, the Adams radial is well known to be a challenge for produce in ready to run model form. It seems that both firms are going to produce detailed high-spec models too. In short, the Adams radial tank is a difficult and complex subject to model and has relatively few options to produce and few instances where a common historical context be found. Despite this, four model manufacturers have invested much time into developing a model of a similar specification and two of these have gone so far in the process that there’s no way back. So what does this story teach us? We’ll only fully know the lessons to be learnt once we see the models in the flesh and see how well they sell. However I do not think that I’m alone in feeling that both Oxford Rail and Hornby will be nervous. This is Oxford models first venture into this particular market that could potentially make or break the new venture. Hornby is only just coming out of a series of well documented production and related profitability problems. So the stakes are pretty high for both firms. I think that the story so far demonstrates a few other things. For starters, the power of the model railway forums and wishlists. I think it also shows that there are a lot of people who collect models because they can appreciate the aesthetics of a prototype rather than wanting to create a “real” scene in miniature. After all, how many LSWR pre-grouping model layouts are around and how many people are desperate to model the Lyme Regis branch? The biggest market for the radial is the preservation scene and I think this example proves how crucial preservation is for the model railway market. Unlike the diesel ready to run market, 00 scale steam models have plenty of scope when it comes to new model development options. Scotland has hardly been touched by manufacturers where (as I’ve started learning,) there is a wealth of potential subjects. It’s fascinating to think that four manufacturers will invest time and money into a prototype with a relatively limited range of operating options before tackling numerically and arguably more historically important prototypes. The model manufacturers are listening intently to their customers. 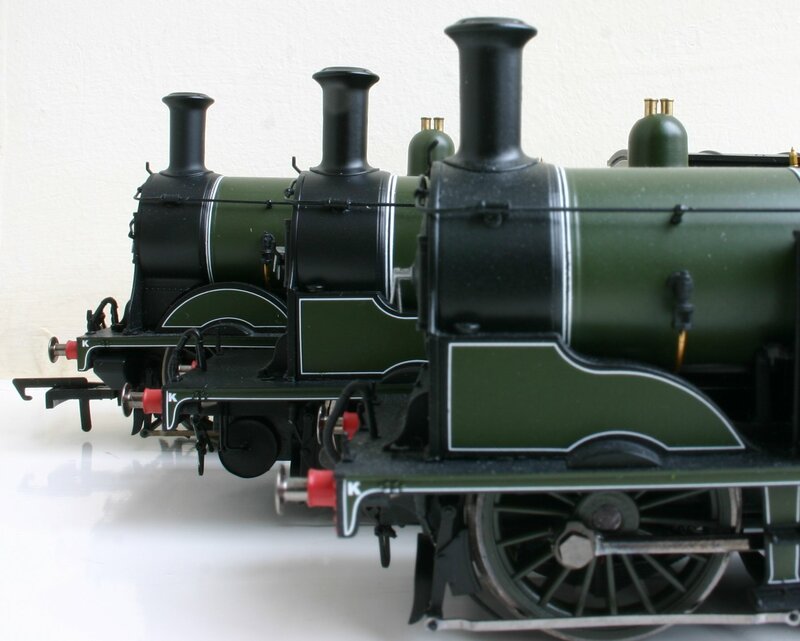 Personally I love the LSWR Adams radial tank and will certainly purchase a 00 scale example, but it is good practice to play the devils advocate every now and then and think about the wider model market and question whether there should be more of a historical steer for greater representation of real prototypes in model form. As a further thought, it makes one ponder further about what makes a subject a popular prototype these days for modellers. Historically there has always been a bias towards bigger express locomotives and so excitement and glamour has a big part to play. Perhaps the Adams Radial Tank example tells us that we customers are becoming more aware that aesthetically pleasing prototypes do not always coming in express form. I think there is also an element of our model railways often being almost a land of fantasy. I know that for me the thought of a longer-term layout having an Adams radial tank alongside LSWR M7, 02, T9 and 700 classes is very appealing, even if they were not nearly as common in Southern Railway days. I think the Adams Radial Tank model story shows that many of us love steam engines, but the emphasis is not always in historical detail. I think for those of us who are fascinated in the detail, this is a minor point overall. It means that there are plenty of people who love steam engines and model railways – it means there is a market. Take my wife for instance; her eyes glaze over if I talk too much about things steam engines. But she does understand that there is a spirit of wonder when it comes to steam railways and seeing them and that riding on them is an enjoyable experience. That’s got to be a good thing for the future. The trick is to see if the likes of this blog and other media can help keep the links between the enthusiasts, model manufacturers and general public alive to try and cater for as many people as possible without diluting the history of our railways. That’s a big challenge for 2015 and beyond I think! We look at the real LSWR Adams Radial Tank in more detail here. If you’re interested in what these Adams Radial tank models might haul, please click here. Thanks for reading!